As you guys already know (from the previous post), Myself and My Wife were on a vacation to South Africa. We boarded the aircraft with mixed feelings. The stage was set for a fantastic holiday. We arrived at Johannesburg at about 0700 hrs. Our rental car was already booked and was ready for pickup. At the rental office, we were pleasantly surprised to received a package. What did this package have? The package had lots of information like maps, detailed itinerary, driving directions, maps marked with routes, suggestions about places to visit on the way, vouchers for the Game Drives, discount vouchers for the Bungee jump etc. This was prepared by the executive from Go Self Drive Tours and was mailed to the rental cars office. This package helped us throughout our trip and we are very thankful to Go Self Drive Tours for creating such a detailed information package. Its the biggest national park of South Africa. Excellent place to spot the Big Five i.e. Elephant, Lion, Rhino, Leopard and Buffalo. We actually were very luck to spot all of them. At about 1530 hrs we reached the Phabeni Gate. We were staying inside the National Park at the Skukuza Rest Camp. There are multiple options to stay in and around the Kruger National Park. I would highly recommend staying inside the park rather than outside the park. Staying inside the park could be a little expensive but its totally worth every penny. The Skukuza Rest Camp is around 39KM from the Phabeni Gate. As soon as we entered the Kruger National Park our game viewing started. Even before we reached our rest camp we saw quite a few animals and birds. We saw all these animals and more. Our accommodation in the rest camp was beautiful and fully equipped bungalow. The rest camp also has a utility shop and restaurant near by. We were surprised to see the items sold at the Park Shop. We could buy anything from a souvenirs to necessity items like bread and soup. We could even buy a travel adapter which fits into South African sockets right at the Park Shop! We spent the our evening strolling around the rest camp and had dinner near the Sabie River. The view of sunset was just amazing! Next day, we had booked two game drives. On these drives we saw, Hyenas, Elephants, A beautiful Sunrise, Rhino, Hippo, Antelopes, Kudu, Zebra, Giraffe, Vultures, Buffalo, Leopard and many birds (whose names I don't remember). Its a beautiful resort with lots of things to do. Sun City is most famous for the water park and the biggest wave pool in the world. At Sun City, two most interesting places we visited were, the crocodile century and the Birds of Prey show. At the Crocodile Century, it amazing to see so many different shapes and sizes of Crocodiles all in one place! Our Guide Feeding A fully grown Crocodile! Our guide also fed a fully grown Crocodile. Notice that blurry object in the above pic? That's a big piece of chicken thrown by our guide into the crocodiles mouth. The second most interesting thing we saw here was, The Birds of Prey show. A guide shows off killer skills of an Owl and Vulture. They also bring out beautiful parrots and feed them in open. We were strolling around in Sun City Resort and we came across a beautiful waterfall. This is one of my best pics. Next day it was time to say good buy to Sun City and move towards Johannesburg. Here is a link to a few selected snaps from Sun City. From Johannesburg we took a flight to Port Elizabeth and next day we started moving towards Tsitsikama. This is a national park with stunning views. Living in Tsitsikamma was magical. Our cottage was right next to the roaring ocean. In the cottage there was a big glass window from where we could see the ocean in its full glory. At Tsitsikamma we also did a Tree Top Canopy Tour. In the Tsitsikamma jungle, these people have build platforms on the tree top. This tour takes you from one tree top platform to the other. The platforms are about 35-65 m high. One has to slide on a rope from one platform to the other. Most amazing thing happened when we were only the highest tree top. Out of no where, one guy proposed his girlfriend! And the girl said YES! Guy proposing this girlfriend on the tree top. Watch closely he has a ring in his hand! Here is the link to selected snaps of Tsitsikamma National Park. I can never forget what happened the next day. Next day we had our biggest adventure of all times! 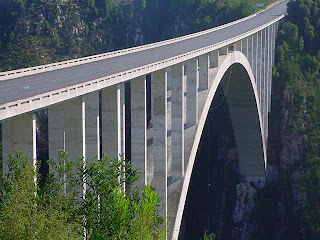 We decided to jump from the worlds highest commercial bungee bridge! We jumped from the center of the arch. Its 216m high! I am going to dedicate a separate post to describe by bungee experience. Till then, stay tuned.